My dynamo sister-in-law, Lara, has outdone herself once again. 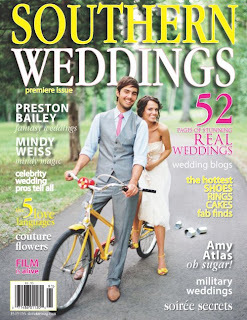 This week, she and her lovely team launched the premiere issue of their magazine, Southern Weddings. If you haven't seen the SW Blogsite, check it out immediately for unlimited wedding-related eye candy (and their 3-part feature on our wedding here, here, and here). I haven't personally seen the magazine yet, but I plan on getting my hands on a copy soon! Congrats to Lara and all the SW girls, I'm so excited for you! How cool is that? I bet launching a new magazine is hard work, but I bet with the topics she'll have a lot of great success! OK - I'm back... I just read your wedding features. Amazing! I love all the laughter in the photos. Those are priceless!